DIJF produced leaflets entitled “GOHANDAMON! 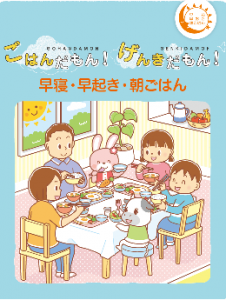 GENKIDAMON!” for primary schoolchildren and their parents or guardians. The theme means “Let’s sleep early, get up early, and take breakfast well!”. Children need to establish a healthy lifestyle early on and to enjoy nutritionally balanced meals from their early childhood. Each illustrated leaflet is designed to outline the importance of well-balanced meals, and to encourage good eating habits with lovely characters. Download and print a leaflet for your own personal use!